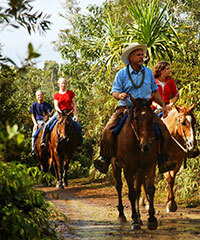 Kauai horseback riding tours are extremely popular. This is largely a function of the fact that Kauai is rural island with numerous cattle ranches and a long history of horses being a part of the fabric of the island. In fact the introduction of cattle in 1793 by Captain George Vancouver paved the way for the wave of Mexican/Spanish Vaqueros (cowboys) who brought their horses over to the islands to tend to the cattle ranches. Kauai's rich tradition of horses and horseback riding has continued ever since. There are a number of fantastic horseback riding stables on Kauai and we offer some of them at discounted pricing. Where can you go on a Kauai Horseback Riding adventure? You can actually ride on the white sands of a beautiful beach along the coast in the Poipu area. This is the sunny side of the island and your ride along the sea cliffs by the ocean will give you an opportunity to look for whales during the season and enjoy the sea life found along the shoreline in addition to enjoying the horseback ride. Located on a working cattle ranch you may see upwards to 50 or so of the most beautiful horses to be found on the islands. How about a horseback ride through the beautiful ocean view ranch lands along the Princeville coastline. This is the magic land of Hanalei with its 'Bali Hai' mountain landscape with mists and rainbows. Look close and you may see a unicorn. Horse rides in this area are some of the best on the island. Ride at a location that is another North Shore gem. Waterfalls, streams and jungles surround you as you ride on perfectly cared for horses of the highest quality. Stop for a lunch and a swim at a waterfall and enjoy your day. 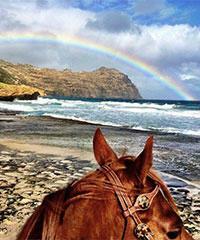 Here's a couple variations you can enjoy on your Kauai Horseback Riding Tour. Take a private ride for just your own group. Some of these rides can include as many as twenty people or it can be just for the two of you. 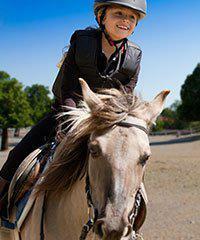 Get really adventurous and include a zipline with your horseback ride on the same outing. None of the Kauai Horseback riding Tours will pick up cruise ship passengers at the cruise ship dock at Nawiliwili Harbor. Passengers will need to either take a taxi to the departure point or have Tom Barefoot's Tours arrange for a Rental Car shuttle to pick them up directly at the dock. Dependent upon the specific tour, Kauai Horseback Rides can be arranged for the Thursday or Friday of your cruise ship schedule. Please book well in advance to assure availability. Well this video is going to be dealing with horseback riding on Kauai. Now Kauai has got a tremendous history of having horses. Actually, Hawaii does in general. The first cattle to show up in Hawaii was on the big island in 1793. Ten years later the first horse showed up on the Big Island. The first ten years of cattle when cattle were here Kamehameha put a kapu on the killing of the cattle so that they could flourish but then they needed a horse to learn how to round them up and move them around, that sort of thing, So, that came ten years later. Twenty years after that was the first of vaqueros or Hawaiian paniolos or cowboys who came to actually make use of the horses and their skills of riding horses and tending cattle. This became a big thing because by that time, now 30 years after the introduction of cattle to Hawaii there was a big industry in beef. With that came the horses to make sure that they were tended to. And the vaquero, the paniolos. Within a short time there were big ranches that happened on Kauai, primarily in the Honolulu region or in the north shore, kind of up in here and to this day we have lots of horseback riding up there. Beautiful in the sense that those rides are kind of meadowland in many places. Jungly, lots of waterfalls and creeks and beautiful vistas of the ocean surrounding. In the background you're looking at the beautiful Honolulu mountains and it is truly one of the most beautiful places you could ride a horse. We have a number of different types of horseback rides that are there and different levels of horsemanship that, can happen within the scope of a couple of different companies that we have in that area. That's not the only area that we have horseback riding though. We also have horseback riding in the south, down in the Poipu region. This is a little bit different. It's the dry side of the island so it's not as jungly but it is better generally speaking if it's going to be cloudy up north you're going to have a great day down south. More days of sunshine and the ranch that we have there goes along the coastline. Right along the water. In some instances you can actually almost get right on the sand and do your little ride. Rides can be a couple of hours or they can be four hours. They can include a picnic and that sort of thing, but if you like horseback riding, horseback riding on Kauai is sensational. If you have any questions about to Tours or Activities in Hawaii, just give us a call or check out tombarefoot.com. We're here to help. 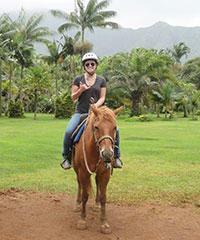 Hawaii Horseback riding is a much more popular category of tours than you might expect. When looking over the state as a whole the category of horseback riding in Hawaii registers over twenty separate and distinct horseback riding companies. You will have to drive to the more remote areas of Oahu, far from the streets of Honolulu and Waikiki, in order to search out your horseback riding adventure but when you arrive at your horseback riding stable you'll be able to enjoy a more "laid back" Oahu experience. 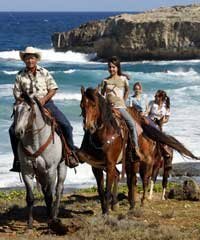 Many of the ranches offering horseback riding on the Big Island of Hawaii allow a more permissive style of riding than found on other islands. With so much beautiful ranch land available for horseback riding it's no surprise that Hawaii horseback rides and horseback stables are a favorite for visitors and locals alike.